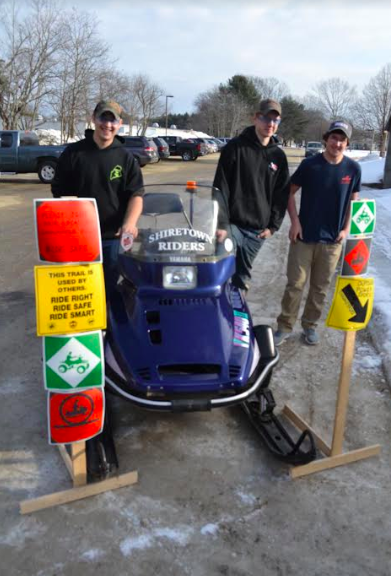 From Left to right: -- Region 10 Outdoor Power students Cam Stanley, Shane Merrillo, and Clay Munsey stand vigil over the snowmobile they overhauled for the Shiretown Riders Snowmobile Club. BRUNSWICK - High school seniors Cam Ridley and Shane Merrill from Brunswick High School and Clay Munsey from Mt. Ararat High School in Topsham just completed rebuilding a snowmobile engine as part of their Outdoor Powersports program at Region 10 Technical High School in Brunswick. quartered in Farmington, Maine. Bill Ross, Region 10’s Outdoor Powersports instructor, is an avid snowmobiler who volunteers weekends during the winter months to groom a 15 mile section of trails maintained by the Shiretown Riders. The sled is now fully functional and purring like a kitten thanks to Cam, Shane, and Clay, and the Shiretown Riders Snowmobile Club has their grooming sled back on the trail. Way to go Bill on the hill!